currently with 3,068 articles and counting! This is a free encyclopedia that anyone can edit. About the Kirby series by Nintendo! Since 2010, WiKirby has been striving to be the best resource for Kirby information on the internet. And you can help us! It's easy - just create an account and head on over to our Help & Policy section to get you started. Not sure where to begin? Check out articles that need more content or the wanted pages. Please keep in mind that once you have an account, you must wait one day and make 5 edits to pages before you can create a new page! This includes your user page. Have fun and thanks for visiting! is out in all regions! is out in most regions! Kirby's Dream Land 3 (星のカービィ3 (Hoshi no Kābī 3), Kirby of the Stars 3) is a video game released for the Super Nintendo Entertainment System in the year 1997. It was developed by HAL Laboratory, Inc. and published by Nintendo. This game is the direct sequel to Kirby's Dream Land 2, adapting many mechanics of that game and continuing the story of Dark Matter. This game was followed by Kirby 64: The Crystal Shards in 2000, which expanded further upon the ideas introduced in this game and its predecessor. In 2009, the game was re-released via the Wii's Virtual Console service. It was later re-released in 2012 with other Kirby games in Kirby's Dream Collection, and again in 2013 as part of the Wii U's Virtual Console service. Kirby's Dream Land 3 continues the central concept of its predecessor by featuring only eight basic copy abilities for Kirby to acquire, but allowing him to pair these abilities with one of his Animal Friends for a different effect. Instead of just three friends, however, Kirby has access to a total of six, with each one offering a different set of strengths and drawbacks, as well as providing unique combinations when paired with an ability. Kirby also has access to an expanded move-set, which includes the Slide technique, the Headbutt, and the Dash. In addition, a second player can join in as Gooey, who can be called forth from inside Kirby's mouth at any time, and has nearly all of the same skills, including the copy ability and the ability to pair with animals. If no second player is available, Gooey can be directed by the CPU to act as a helper similar to the ones in Kirby Super Star. April 1st, 2019 - April Fools! We have a new featured article, about the elusive and mysterious enemy called Dracula Waddle by fans. Check it out! March 8th, 2019 - Get your new woven hats ready! Kirby's Extra Epic Yarn releases today in North America and Europe, and tomorrow in Australia! Patch Land is waiting for your triumphant return; just watch out for Devils! February 21st, 2019 - WiKirby has just reached the 3000 article milestone! A huge thanks to everyone who helped us reach this point, and may we continue to grow further. Shortcake and Energy Drinks all around! November 25th, 2018 - It is revealed that The Three Mage-Sisters will unambiguously become part of Kirby's Dream Friend entourage in the upcoming update to Kirby Star Allies. Kirby always finds a way to make friends! Look forward to playing as them along with the others on November 30th! November 8th, 2018 - The final wave of Dream Friends - in addition to a new mysterious mode - have been announced for Kirby Star Allies, set to release on November 30th, 2018! To round up the line-up, the new friends include Magolor, Taranza, and Susie, making all three playable for the first time. September 18th, 2018 - Heads up, Dream Landers! This year's Cross-Wiki Weekend will be happening this weekend, from the 21st to the 23rd of September! Head to the WiKirby:Cross-Wiki Weekend page to learn how to take part! September 13th, 2018 - In the Nintendo Direct, a remake of Kirby's Epic Yarn is announced for Nintendo 3DS, titled Kirby's Extra Epic Yarn! Coverage to come soon! July 27th, 2018 - Kirby Star Allies is updated to version 3.0.0, adding three new Dream Friends to the game, making adjustments to Guest Star ???? Star Allies Go!, adding three new Celebration Pictures, and other changes. This artwork was given out as a wallpaper to digital purchasers of Kirby Star Allies as a bonus. 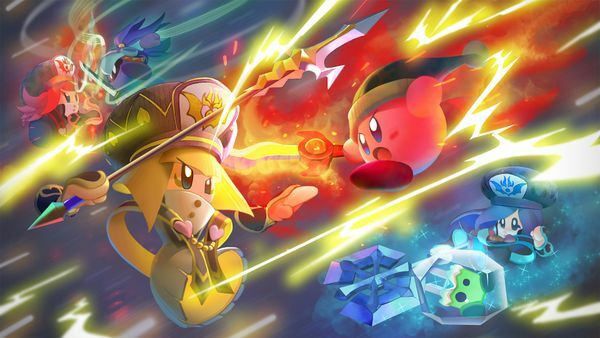 It depicts Kirby along with allied Plugg and Bio Spark battling against The Three Mage-Sisters in a dramatic action shot and blurry background resembling The Divine Terminus. I must say, that picture would look neat on our main page. Per all. Today's video features the official animated trailer for Kirby: Star Allies in Japan! Check back daily for new videos. ...The Noble Haltmann is two verses longer in the original Japanese than it is in the English localization? ...HR-D3 - a hidden Boss in Kirby's Return to Dream Land - was originally made for the canceled Kirby game for the Nintendo Gamecube? ...it is possible to play Guest Star ???? Star Allies Go! as Kirby? N.I.W.A. 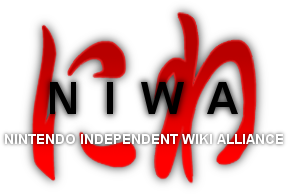 is a family of open-content encyclopedias based on Nintendo franchises, vowing to be now and forever independent! Other Nintendo franchise wikis are welcome; please visit the N.I.W.A. forums to suggest candidate wikis! WiKirby wants to share some useful tools for wiki working. Feel free to suggest anything we may have missed. If you aren't currently using any of these, we recommend looking into them at the very least. All are free of cost, easy to install, and even easier to uninstall if desired. - Discord is a free chat service which is used by several of our admins to communicate with editors and for users to talk with each-other and share news, Kirby-related or otherwise. We have a special channel which you can join by following this link: Shiver Star - WiKirby Discord. Read more here. - Skype isn't wiki specific, but is a useful method of getting a hold of the staff here and discussing things for the site, or Kirby in general. Most people associate skype with voice chatting, but we only use the text chat, since it's free and more effective than IRC. read more here. - Lazarus is a Firefox add-on which automatically stores everything typed into text fields. It's very helpful for when you're wiki editing, because you won't lose anything if your browser crashes or you accidentally leave the page! You can just go back, right click, and open the data with Lazarus! It can be a real lifesaver. Download it here. This page was last edited on 2 April 2019, at 01:01.